The bag is gold-toned, echoing the warm brown colour of caramel. Like Strawberry Pavlova, the bag is surprisingly full. Its contents have a pleasing chocolate and burnt sugar scent that's not too sweet. Salted Caramel is one of the two flavours in the range that uses milk chocolate as the covering (the other is Crunchy Mocha). To complete the outer coating, the chocolate is liberally dotted with pieces of salted caramel. Each piece is about 3cm wide by about 2.5cm tall, enough for a mouthful without being overwhelming. The coating of salted caramel pieces is quite firmly attached to the chocolate, and while there are some loose in the bag, it's not as many as I was expecting. The little pieces are surprisingly strong in their flavour. They have good caramel notes, but are sweeter than what I was expecting for salted caramel. I also don't think they are made from actual caramel, but they seem to be little balls of flavoured sugar. It's quite hard to taste the marshmallow without getting the outside included, but I shouldn't have bothered. The marshmallow itself has barely any flavour at all - which isn't such a bad thing when you consider how much flavour the dots on the outside contain. Eaten altogether, the dots more than make up for the marshmallow's lack of flavour. 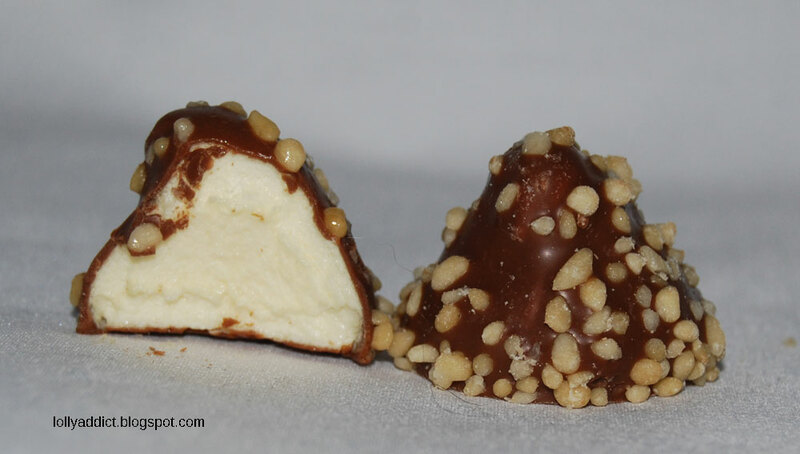 They and the chocolate coating provide a sweet, crunchy texture juxtaposition against the soft, bouncy marshmallow. Admittedly, there isn't a whole lot of salt that I can taste, but perhaps it is just overpowered by the other flavours. There should be some presence, though - salt is the third ingredient in the list for the dots. Caramel and chocolate are a perfectly acceptable combination in my book, with or without the trendy addition of salt. I'll easily demolish this bag. 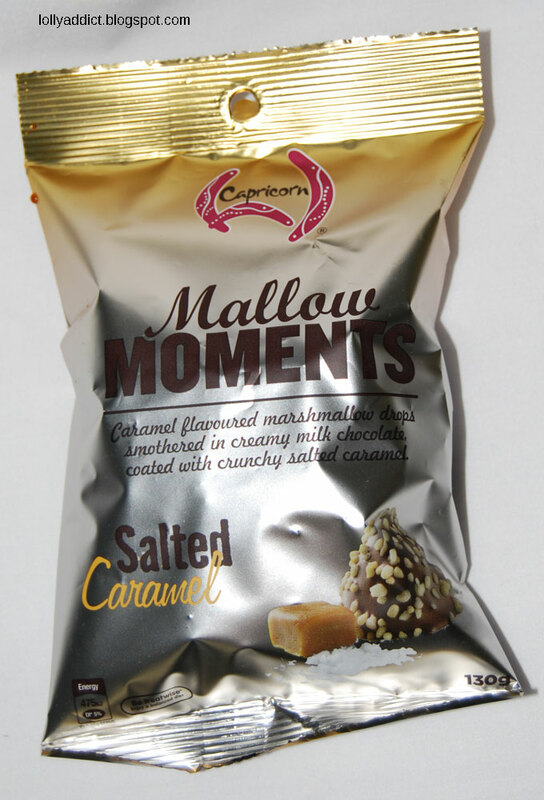 Capricorn Mallow Moments Salted Caramel are made in Australia. 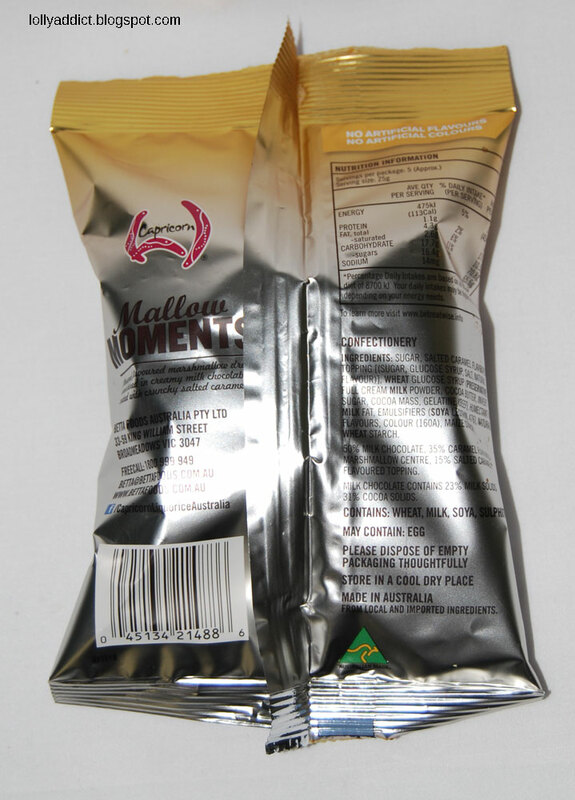 They contain wheat, milk, soya, sulphites and preservative 220, and may contain egg.